Can you see yourself as a belly dancer? (in a good way) - and sharpen your mind. All while having a laugh. A summary of the belly dance beginner choices. Introduction to Belly Dance - a solid introduction for everyone (guys too) - no dance experience needed! 8-week belly dance course (75 minute classes). - no dance experience needed! Belly dance is an exciting, exacting and fun dance form. It takes more than 8-weeks (10 hours) to learn to belly dance but Kashmir's Introductory belly dance course gives a solid base for beginner belly dance students to build on over years to come - no matter what style you decide to pursue. In the Introductory Belly Dance classes you will learn how to move your body is a typical belly dance way - with your hips and shoulders - and also some travelling steps and arm movements; you will be given an introduction to interpreting belly dance music; you will also be given background information about where belly dance has come from and how it is changing with min-lectures and videos. Belly Dance Basics is a one-hour version of the Introductory course. In this the cultural information is scaled right back so it can be offered in any dance studio. There are two alternative beginner class that are run when there is sufficient interest. The Saturday Special provides 4 weeks of belly dance with an emphasis on using belly dance moves in combinations. If you organize your own small group you can choose your own day and time - and the four weeks will cost you only $280. There is also Belly Delight which introduces more standard belly dance technique which can run for any term length. (classes will run with three pre-paid students on a scheduled class - or four students for a special). Sometimes there are also folkloric classes that a beginner can join. These are the sister and mother dances of belly dance. They can be enjoyed for themselves, performed with a group or adapted and added to Orientale. Kashmir occasionally offers afternoon classes for girls. There are no current Girls' classes on offer. If you want to continue, Kashmir has a range of NextSteps classes which group students of similar experience and ability. 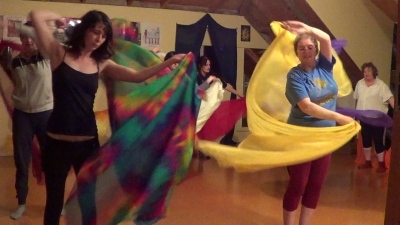 These classes may work on choreography - straight belly dance or with props such as veil, zills, or cane - or they may revise technique, work on improvisation or study a folk style. Kashmir has been studying belly dance and Middle Eastern folk dance for over 20 years and has been teaching for 16 of those. Her areas of expertise are Egyptian dance and safe movement generation. The movements taught in the Introductory bellydance course are designed on safe posture and build in complexity as ability grows. Kashmir has been teaching belly dance in Christchurch, New Zealand, since 1997. She brings both a love of belly dance - which she has studied since 1991 - and an interest in teaching (it is a sad fact that some excellent dancers are poor teachers). Kashmir not only trained and had experience as a Secondary School teacher but undertook further study in teaching dance from the Queensland University of Technology. A further interest is "Safe Dance Practice" - which in addition to the unit with QUT - Kashmir has attended lectures and practicals with several physiotherapists. For fuller information on Kashmir's background - check out details of her training (in belly dance, folkloric dance, teaching and related topics). When you come to learn belly dance with Kashmir, most likely your belly dance class will be in her belly dance studio in South Brighton, Christchurch. Kashmir has been teaching from her own studio since 2001. The studio is small - but that's okay because Kashmir feels it is important to be able to give each belly dance student enough one-on-one attention. The only fitness test is you can climb one flight of stairs. This leads to the studio lobby. Then you are in the dance studio with mirrors, posters, veils and other belly dance related trappings. When you start belly dance classes with Kashmir, you will normally begin with an 8-week Introductory course. This assumes no prior knowledge of the dance. Over the next 8 weeks you will begin to learn how to control your body - so it does exactly what you want it to do. These are the first words of belly dance - moving your body. You still are not dancing - but you can begin to communicate. There are also optional lessons on costuming and learning about what areas your body needs to look at to optimize your dance journey. Then what? For some people that is enough - a taste of the exotic - then something else. For those who want to continue, Kashmir offers continuing classes (minimum class size is four) in her style of belly dance - belly raqs®. Most groups choose to work on a choreography. This gives a safe framework to extend dance knowledge. You will sharpen up your technique, add new moves and learn more about transitions. If belly raqs® with Kashmir is not your preferred belly dance style, the 8-week course provides and excellent grounding in basic technique which can be used with other belly dance teachers. Classes will be offered Monday and Tuesday evening. Classes will only go ahead with three pre-paid students. Too Shy to Learn Belly Dance in a Class? Contact Kashmir about one-on-one belly dance tuition. Here is some feedback from students learning belly dance from Kashmir. They are having fun with belly dance - and so can you!